The Christian County Sheriff’s Office employs several commissioned Deputies for Patrol, Criminal Investigations, Court Security, Civil Service, and Corrections, as well as several civilians in Support Services and clerical positions. Christian County covers approximately 564 square miles in Southwest Missouri and is bordered by Greene, Lawrence, Stone, Taney, Douglas and Webster County. 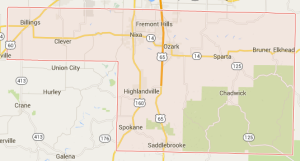 Cities within Christian County include Billings, Chadwick, Clever, Fremont Hills, Highlandville, Ozark, Nixa, Saddlebrooke, Sparta and Spokane.